Keeping properly functioning wiper blades is an important part of maintaining a safe vehicle. If you don’t maintain your wiper blades, you could get caught in a downpour and be forced to pull over until you can see well enough to drive again. If this were to happen during a time you were unable to pull over, it could be extremely dangerous. The blades on your windshield wipers are made from rubber, and they will rot or otherwise wear out over time. This is especially true if you live in a climate where it often rains or snows. 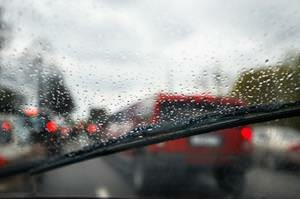 The more often you use your windshield wipers, the more often you need to consider replacing them. However, they will break down in the heat as well, so even if it doesn’t often rain, you still need to replace them occasionally. You can have it done by a mechanic, but it’s much easier to just do it yourself. Your wipers have three separate parts: the rubber blade, the metal blade and the arm of the wiper. The only part that you need to be concerned with for this process is the rubber blade. Occasionally, another part of your wipers might break, but the rubber blade is the area that most commonly needs to be replaced. If you notice that your wipers are leaving streaks on your windshield instead of wiping it completely clean, it’s time for new blades. You can also check your blades by looking at them. If the rubber appears cracked or dried out, you should invest in a new pair. First, you will need to figure out what size to buy. Remove the old rubber blades, lay them flat and use a measuring tape to figure out the size. Be sure to measure both of them because they are usually two different sizes. When you are sure of what you need, visit an auto-parts store and buy the new blades. They should cost you about $15 each. To put in your new blades, you will first need to raise the windshield wipers so they are up and away from the glass. Simply lift them up until they reach the position where they stay upright on their own. Next, unhook the old wiper blade. There should be a joint where the rubber meets the metal arm, and on that, you should see a small plastic stopper or pin that grips the rubber and keeps it in place. Press that stopper to release the rubber and then gently peel it away. Now, you will need to attach your new rubber blades. To do this, simply slide the fresh blade in the same way you took the old blade out. When it’s in place, snap the hook or holder that secures it. Then, carefully put the wipers back down into their normal position against the windshield. Note: If you don’t fully have the wipers in their upright position, they could slam back down and crack your windshield. This usually won’t happen as long as you’re careful, but if you’re worried about it, you can protect your windshield by laying a towel across it during the process.